I write this hoping that you’ll support our efforts to ban commercial cannabis activity in our county. Indian Valley, according to the Sheriff’s Office, has a high concentration of commercial growers. Two pro-commercial activity ordinances may qualify for the ballot in November. If successful, they would invalidate the moratorium (which bans commercial activity) passed by the Board of Supervisors (BOS) this past November. This moratorium gives the county Planning Commission and BOS two years (until October 2019) to develop a cannabis ordinance and civil code. If either ballot initiative is successful, the county will have cannabis laws written by and for the interests of the commercial growers. Mr. Hagwood told me recently that commercial growers have ignored the fact that commercial cultivation is not permitted by the county, but now are ready to obey the laws as long as they write them. His From “Where I Stand,” to be published on the 28th of March in our local papers, will detail his views. The Citizens Group for a Responsible Cannabis Ordinance (CGRCO) supported the moratorium and produced a draft cannabis ordinance that does not inhibit individual grows of up to six plants, as Prop. 64 permits, but bans commercial activity, accept for the distribution of medical or adult recreational cannabis from out of county dispensaries for those who do not wish to grow their own. This ordinance and one other is slated to be reviewed by the Planning Commission. A similar ordinance was passed by the Portola City Council. Prop. 64 called for decriminalizing adult use—it did not mandate the right of commercial growers to farm anywhere in the state they wish. Each county or municipality has the right to decide whether to permit commercial activity. And to date 75 percent of the California cities and counties have passed ordinances or moratoriums that prohibit commercial activity. The reasons why the CGRCO and I are opposed to commercial activity are many and are outlined on this site. Our TEAM page provides a growing list of our leaders and supporters (now over 250). PlumasGrow.com provides many opinion pieces, informative articles, and Q&As. We hope you find it helpful. If you share our views or wish to learn more, would you be willing to participate in a meeting in Greenville or Taylorsville this week or next? We have found weekday evenings best, but wish to accommodate as many as possible. If you’d like to make your home available for a meeting, please let me know via email at jmunozj@msn.com. Would like to see this ordinance that’s going to Supervisors be on the ballot next to the pro grow one is that possible ? 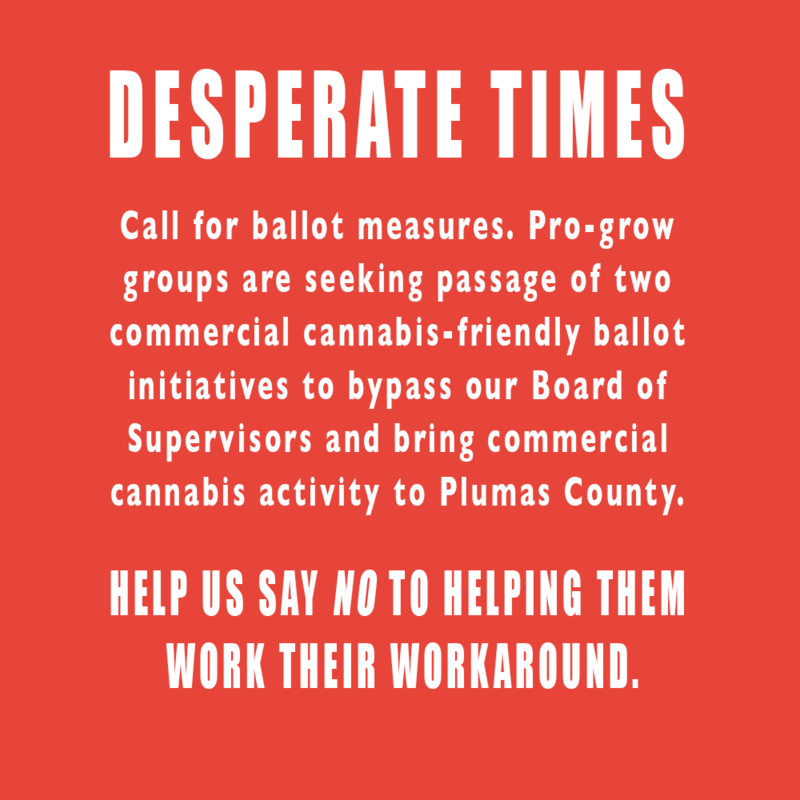 Thank you and the team for the diligence in standing against Commercial Grow in Plumas County. Might we continue to take a stand against this greed, which potentially could do great damage to life as we know it her in PC. Evening meetings are tough, especially driving from Meadow Valley. Don’t think I can make it. I am available anytime this week or next. Just tell me where to meet.